This past Wednesday, my sister and I went to see Jonathan Richman at the Middle East Upstairs, his second of three consecutive shows there. I'd never been to a show Upstairs, and it was a perfect little venue for JR with a capacity of only 120 or so. Richman tends to stray away from the microphone frequently, but we had no trouble hearing his singing and strumming, even un-miked. 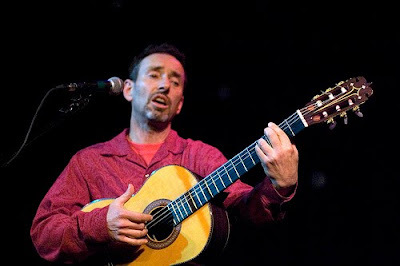 How to describe Jonathan Richman? For anybody reading this who has no idea who Richman is, you probably actually do. He's the guy playing guitar with his drummer (Tommy Larkin, who continues to play with him at every show) through the Farrelly Brothers movie, There's Something About Mary. Richman is now nearly 60, and he has been a quiet presence--both literally and figuratively--in the American music scene for most of his adult life. But I'm not here to write a biography; you can go to Wikipedia for that. I'm here to say what he means to me. I have been thinking a lot lately about my musical comfort food. I'm hoping to do a post before too long about my comfort food albums of the past decade, but Jonathan Richman is a full-on comfort food artist. He is for many an acquired taste, and some people never understand his appeal. His singing voice is uneven, his guitar playing is quirky. His songs can range form silly to political to romantic to incredibly sad. Sometimes a single song can be a little bit of all those things. On stage, as my sister says, he can be a bit of a man-child. My sister (who quite frankly, is much better at this type of thing than I am, though I'm the one who continues to barf my opinions onto the internets) compared him to the 8-year-old boy who's parents make him come out to play songs for their adult party. He can waiver between nervousness and showing off in the blink of an eye. At times it looks like he's really enjoying himself; other times he looks antsy to get off the stage. That's how he's been every time I've seen him--this was my third Jonathan Richman show in the last 10 years. The audience at the Middle East was noticeably older. This was the first show I've been to in ages in which I didn't feel like the oldest person in the crowd. In fact, I felt like one of the youngest. But Richman makes everyone feel young with his energy. Twice during the show he managed to sustain a sing-along. One occurred during his always entertaining rendition of "I Was Dancing at the Lesbian Bar", during which he not only did his special hip-shaking dance, but traded his guitar for a set of jingle bells, then a cowbell. I've seen him play this song at every show, and it's always one of my favorite parts. Years down the road, if someone asks me what my favorite musical memories are, watching Jonathan Richman play this song will almost certainly be in the top 10. He also whipped up a sing-along towards the end with a bizarre little anti-cell phone song. Richman is pretty clearly not a fan of technology (he has no official website), and I believe him when he says he will never own a cell phone. The song was particularly apt for my sister and I, who were just talking before the show about how we rarely use our cell phones. They are a necessary evil for me, so I'm with Mr. Richman on this one. The bottom line is, I will likely continue to go to his shows as long as keeps touring. Neither his albums nor his live performance are for everybody, but for those of us who "get" Jonathan Richman, they are incredibly rewarding. He may have the saddest eyes I've ever seen, but he still manages to elicit a deep sense of joy in me every time I see him play. I'm generally a pretty happy guy, but though my children can often raise my happiness to the level of joy, it's rare for a musician to do so. To experience that feeling in room full of strangers, listening to music I love...that's really something. There are several reasons I have not been blogging as much lately. There are the standard ones like family, work, and the holidays, but I've also been reading a lot. I don't think there's been a point in my life since I was about 7 that I didn't have at least one book going, but lately I've had 2-3 going at a time, and I've just felt more like reading than blogging. But now I'm gonna blog a bit about what I've been reading, so there you go. There is no way to describe the plot of this book without making it sound derivative of at least two famous fantasy series: Harry Potter and the Chronicles of Narnia. Quentin Coldwater, our anti-hero, is recruited into a school of magic, and eventually ends up learning that the fantasy world he's been reading about since he was a child, Fillory (which is basically Narnia), is real. That's not much of a spoiler, trust me. The twist here is that instead of young, relatively squeaky-clean British kids visiting these magic settings, we have older, far-from-innocent American kids doing so. The novel can in some ways be read as a long thought experiment. Yes, many of us grow up reading about kids who learn to do magic or travel to magical lands, and of course we always wanted to be those kids, right? Grossman takes a step back and asks, really? Would you? If you had magic powers and could do virtually anything you wanted, wouldn't you get bored after a while? And as far as magical lands go, how much fun do you think being in constant mortal danger actually is? I can't say any of the characters are particularly appealing--they're all pretty much jerks. But that's kind of the point. Nice people apparently don't make particularly good magicians. Characters that don't promote a lot of sympathy aside, the story moves along quickly. It takes Harry Potter 7 books to get through Hogwarts, but it takes Quintin Coldwater 2/3 of a book to get through Brakebills Academy. If anything, the last 1/3 of the novel moves a little too quickly. Grossman could have easily stretched the time in Fillory out for another 100 pages and I wouldn't have minded a bit. All in all, a very fun book, and I would recommend it to any reader (over the age of 13 or so) who's ever read a fantasy novel and wanted oh-so-much to escape into that book. The Magicians will definitely force you to rethink that notion. Though I have been a parent for nearly 3 years now, I've never been much for parenting books. Many of them seem to work along the lines of "Hey, this worked for me, so it will obviously work for you! ", which as most sane parents know is complete shite. You might call it the Jenny McCarthy class of parenting books (speaking of which, hurray for The Lancet for finally retracting the vaccinations-lead-to-autism paper!). This book caught my eye, however, because it's based almost entirely on published literature and interviews with actual scientists. Indeed, the reference section alone accounts for about 10% of the books length. Though the authors share a few personal anecdotes to demonstrate their points, the book is by and large a summary of very real research. Several topics are discussed: the importance of sleep for kids' development, the actual causes of aggression in young children, sibling rivalries, how to build a child's vocabulary quickly, and perhaps more importantly, how not to. Many parents have learned by now that the Baby Einstein series not only fails to help kids talked sooner, it can actually impede speech development. This book explains why. There's a chapter on lying, and why it's not necessarily a bad thing when kids do it. In perhaps one of the most eye-opening chapters for me, the authors tackle the dogma that thrusting a child into a multi-ethnic environment will help make them "color blind". And in my favorite confirms-my-suspicions chapter, the authors essentially trash the idea that kindergartens for "advanced" kids are worth a damn. All of this is presented in easy-to-digest prose--it's a quick but informative read. NurtureShock has not become my new parenting bible, but it has changed the way I interpret the behavior of my children, in what I have to believe is a good way. I would even go so far as to recommend this book for non-parents, because chances are you will have to interact with children some day, even if they aren't necessarily your own. I can direct you to my earlier review of Hodgman's first book, and that would pretty much cover my bases here. This book is basically a continuation of The Areas of My Expertise--the page numbers even start where the last book's left off. Only this time we have a list of mole man names instead of hobo names, and Hodgman himself was a bit more famous when he wrote this book. Is it essential reading? Absolutely not. Is it still pretty damn funny? Yes. That is all.